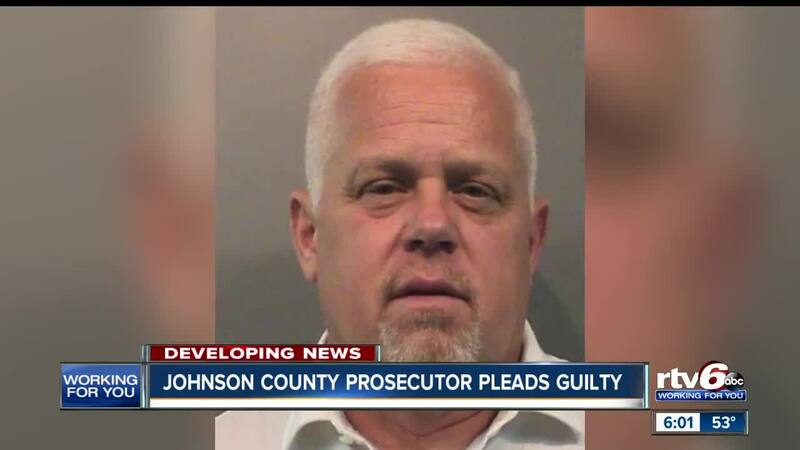 GREENFIELD — Johnson County Prosecutor Brad Cooper has been charged and pleaded guilty in a battery and confinement case. Cooper has been formally charged Monday with criminal confinement resulting in bodily injury, domestic battery, identity deception and official misconduct. According to a news release from Indiana State Police, Cooper appeared in Hancock Superior Court II on Monday and pleaded guilty. Zach Osowski, a spokesman for the Indiana Prosecuting Attorneys Council, said under state law once an elected official either is convicted of or pleads guilty to a felony, they are removed from office. Under state law, the chief deputy prosecuting attorney becomes the acting prosecutor until a party caucus appoints a successor, Osowski said. According to the terms of the plea bargain, Cooper will avoid any time behind bars, serving 540 days on supervised probation. Formal sentencing is set for July 12 at 2 p.m. in Hancock Superior Court 2. In early March, the Johnson County Sheriff’s Department was called to a house in Trafalgar shortly before midnight. When they arrived, they found a woman whose right eye was “swollen and bruised,” according to a police report. The woman had fled to a neighbor’s house to make a 911 call. When the sheriff’s department learned the incident involved a public official, Indiana State Police took over the investigation to make sure the case was handled appropriately. It is RTV6 policy to not release information on investigations until formal charges have been filed. It is also RTV6 policy never to disclose the name of an assault victim. The victim issued a statement through the special prosecutor's office. "Today, justice was served. Bradley made mistakes," the victim wrote. "He admitted to those mistakes in court and is now willing to accept responsibility. I forgive him. After all, he is human just like you and me. I have faith that God is working behind the scenes to turn this nightmare into something good. My prayer is that he will come out on the other side a better human being because of all of this." Special Prosecutor Doug Brown also issued a statement. "When things get tough, you toughen up, and that is exactly what the victim did in this investigation," Brown wrote. "Her grace and resolve had been inspiring. The plea agreement accomplishes her desire for privacy, healing and moving forward. The proposed plea also accomplishes the State's interest in justice. The Indiana State Police is to be commended for their diligence in conducting this investigation." In 1994, Cooper joined the Johnson County Prosecutor’s Office and rose through the ranks from a deputy prosecutor to chief deputy prosecutor. In 2009, he was elected as county prosecutor. His online biography touts his record of getting convictions in 4,000 felony cases in a 20-year period. RTV6 has reached out to Cooper’s attorney for a comment.